how about you bump this thread every time some offer is out? if you keep your ear to the ground you'll catch wind of all sorts of freebies and bargains that manufacturers put out there to attract buzz. currently it looks like you can nab an acustica tan compressor for free from their site! Tracktion just recently updated the free version of their DAW from T4 to T5. Nice little DAW and quite capable...upgrade price to recent version is also ridiculous. Should we stay AUDIO only or the whole AV spectrum? that tangle thing looks pretty groovy, will probably go for that! Edited by Mesh Gear Fox, 29 July 2016 - 02:37 AM. Thank you for reminding me - was meant to pick this up when first announced but totally forgot ! Cubase upgrades are 40% off until 15th August. If we're opening this up to video, I've been using Shotcut recently and I have to easy, I'm pretty impressed. It looks pretty basic at first but there's a lot more going on than it appears once you realize that its compositing is done at the clip level rather than the layer/track level (the whole interface is geared toward working on a single layer as much as possible). Plus you can build custom filters HTML5, kind of like JS in Reaper. I just downloaded it out of curiosity because I'd never heard of it, but it's become my go-to video editor since I can't justify buying Vegas and don't pirate stuff anymore. EDIT: it's fully portable, too, no installation. Edited by RSP, 31 July 2016 - 12:02 PM. Bought it today, very fun, easy to use and has some great sounds. Edited by beathaven, 31 July 2016 - 12:17 PM. 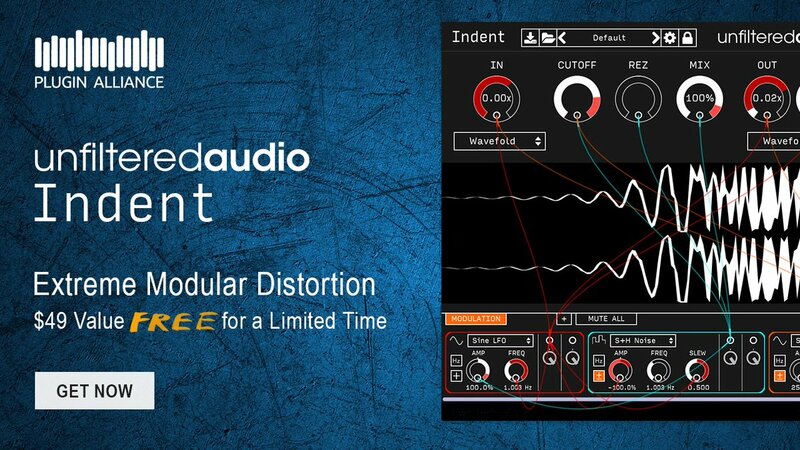 cool looking delay plugin here, usually $40 but is free with this offer. Edited by Mesh Gear Fox, 01 August 2016 - 08:28 AM. Indent! from unfiltered is currently free. $49 value.. but free for 2 weeks. rad plug in. great modular modulation system. it's thru plug in alliance so you might have to make an account but totally worth it. Worth $200 but in September if you're a registered Focusrite user - nuffink ! nice! i have a scarlett 2i2 but i never registered it. do i just need to log the serial and create an account? I've heard rumours that just starting an account without a product is enough. I've have an 8i6 for years and just flipped it over to find the serial number and that kept it happy ! Do you know the background to that one Rubin - legit free samples or thieved from some commercial pack ? What's it got in it ? I just downloaded / unzipped - its a bunch of WAV samples. 6 Gig unzipped. They are very well organized and labeled. Would recommend downloading. Jlin Narlei from Planet Mu http://planet.mu/artists/jlin/ posted it on her FB, and then DJ Food and Nmesh relinked it, so I'm assuming legit? She has done this before apparently. Just checked, you can't start an account without a product serial number unfortunately. Not a fan of using iLok if I can avoid it, but the demos do sound really nice. I got the eventide free reverb plug last night as a focusrite user ..took a while to install and im yet to test it but seemed stupid to miss it when it's usually super expensive. N.B. You'll need an iLok account (not necessarily the hardware dongle - works with the software license manager too). I've used the software version of iLok for a couple of years now and it really isn't as obtrusive as I feared it'd be (you'll never notice it's there unless you go load the app to register your machine to a newly purchased plugin). Being able to activate a whole bunch of stuff in one go when moving from one machine to another is definitely speedier than entering a whole bunch of long serials or relying on a challenge/response key (on an old server that might be down!) for each plugin..
Yeah, that's a cool EQ. Quite enjoying it so far.